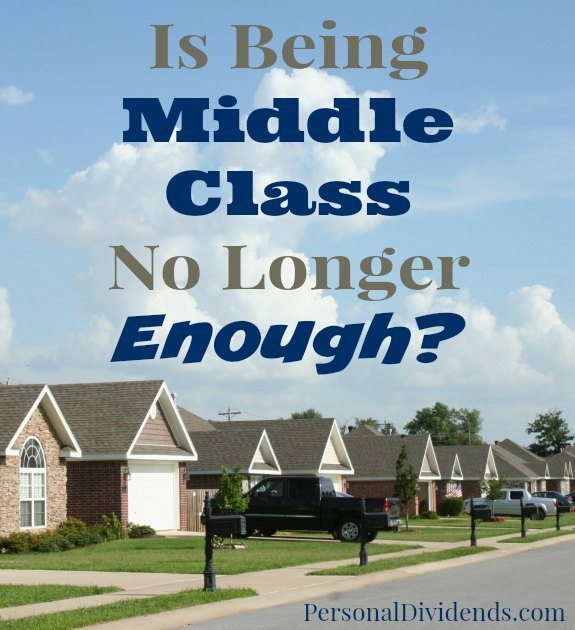 Is Being Middle Class No Longer Enough? We often think about “being middle class” as living with enough. If you’re middle class, you might not be “rich,” but you usually have enough to cover your needs and some of your wants. We often think of being middle class as being able to handle what you need, as well as maybe take a vacation every couple of years, or enjoy some small luxuries in life. Vacations: In order to afford a vacation, many in the middle class have been cutting back on TV purchases, trips to the restaurant, and even new clothes. New cars: According to the USA Today article, a new car’s sticker price is likely to be a little more than $32,000. That means that most middle class families have to make due with used cars — or keep driving their cars until they no longer work. Pay off debt: Even more disturbing than the inability to go on vacation or buy a new car, is the idea that a middle class income might not be enough to pay off debt. The USA Today article says that debt is growing faster than income. It’s not just credit cars. Mortgages, student loans (which some think will be the next crisis), and even medical debts. Emergency fund: We consider emergency funds the cornerstone of good finances. They allow us to prepare for rainy days, and avoid debt. However, many families don’t have enough extra each month to set aside money in an emergency fund. Retirement savings: According to the article, many in the middle class are so burdened with debt and other rising life expenses that they can’t set aside adequate money for retirement savings. Retirement planning is vital for the future, but many in the middle class aren’t able to. Medical care: Companies increasingly expect employees to take on health care costs. Health care costs have been rising for decades. The yearly rise has increased at a slower rate recently, but there is no getting rid of the increase, and more middle class families have a harder time meeting their medical cost obligations. Dental work: Dental insurance can be expensive, and it often doesn’t cover what you need it to cover. As a result, it can be difficult to pay for what you need. A number of middle class families, according to the USA Today article, just decide to avoid expensive dental procedures to save on costs. One of the interesting things about medical care and dental work is that many offices now offer access to lines of credit to help you pay for your work. Even they know that co-pays and meeting deductibles can be difficult to afford without help. Of course, this adds to debt, and makes it harder to set aside money for retirement and emergency funds. It kind of turns into a cycle for many middle class families. Can You Still Get Ahead? The real question, of course, is whether or not the USA Today article represents a hopeless situation. It’s true that the current climate offers a number of hurdles to middle class families. However, it also doesn’t mean that things are hopeless. Many families need to start getting creative with how they manage their money. Some families eschew the trappings of today’s middle class lifestyle. They decide that they don’t need a lot of stuff, and that big TVs and expensive cable packages are unnecessary. Some of them also refuse to buy new cars, or even get multiple cars. There are a number of creative ways to reduce materialism and costs, while still enjoying life and making memories as a family. Others look for ways to earn extra money. Technology makes it possible to do more from home than ever before. And, with traditional jobs less stable than before, it can make sense to start a home business in order to get the money needed to pay down debt, save for retirement, and/or build an emergency fund. What do you think? Is it harder for the middle class to get by today? Are there ways to overcome these problems?